You don’t often hear lines like “there’s nothing like life in the country-side” bellowing earnestly out of a West End theatre. 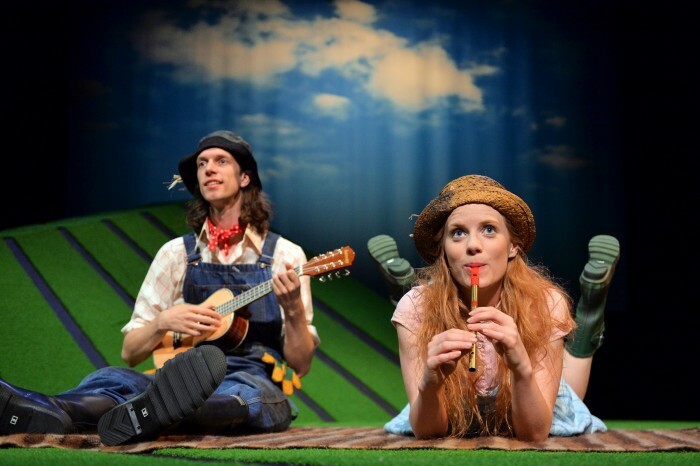 Yet The Scarecrows’ Wedding by Scamp Theatre is a veritable theatrical pastoral, bringing to life another literary hit by Julia Donaldson and Axel Scheffler, authors of the Gruffalo, Stick Man and Tiddler – all part of Scamp’s past repertoire. There’s much to enjoy in this production: Darren Clark’s versatile, catchy score, Eva Sampson’s clever stage-craft and the cast’s vibrant performances all generate audience excitement. At this stage however, it does not feel like the show has quite found its overall shape yet. Like most adaptations of pre-loved prose, the piece is confronted with the notion of audience expectations. The creators have lovingly taken the original narrative apart and pieced it together with songs and set pieces, missing numerous opportunities to create dramatic tension. There is a protracted exposition introducing various aspects of the world of the book, the characters and, eventually, the story. The show’s publicity promises an exciting antagonist – the “devilishly smooth” Reginald Rake – but this exquisitely theatrical element arrives on the stage far too late. The piece would have benefited from tighter editing or a structural input of a dramaturg. Though it lacks the polish of a West End show, this particular adaptation has the potential to find its feet in the more intimate venues on tour as it capitalises on the charm of its cast and its musical energy.